Research Institute - Shenzhen Daceen Technology Co., Ltd. 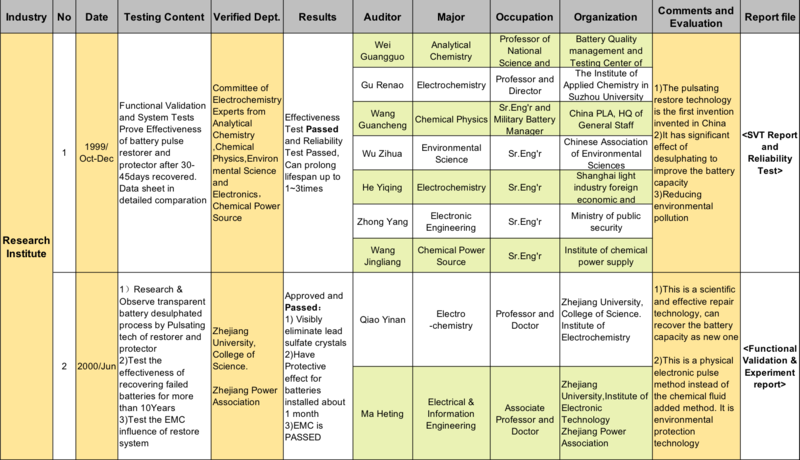 It is the Functional Validation and System Testing History sheet list in Zhejiang University and Research Institute. From 1999/Oct, Tests performed by Zhejiang University and Electrochemical Research Institute. 3) Members of expert group come from various fields, such as chemistry, electrochemistry, physics power supply, environmental sciences, electronic engineering, etc. Upon our most advanced and reliable technology, In April 2001, expert group jointly published the academic papers titled as <Study on Recovery of Dead Lead Acid Battery Using Pulse Technology>.